One of our favorite doctors, Ben Carson, MD, the keynote speaker at one of our Glycomic Conferences, sits down and discusses what is wrong with the proposed healthcare reform. “My biggest problem is I feel it’s going in the wrong direction.” In the interview, Dr. Carson said, “That’s one of the things that disappoints me about the lack of honesty … We can’t really debate when there’s all this subterfuge.” Pointing to doctors that he brought to the White House and gave white coats to put on, Obama declared, “Nobody has more credibility with the American people on this issue than you do.” Here is one of the most credible doctors in America. Here, you can read part of this discussion or watch the TV interview. Yet one of the nation’s top surgeons, with credibility and acclaim the world over for the pioneering surgeries he has and his personal story of overcoming hardship, recently ripped the dominant health care legislation before Congress in a critique similar to that of conservatives and libertarians. 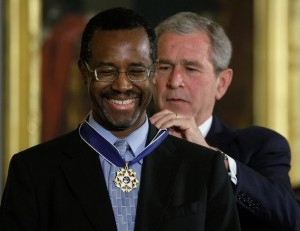 Benjamin Carson, director of pediatric neurosurgery at the Johns Hopkins Medical Institutions in Baltimore, Md., and recipient of numerous awards including the Presidential Medal of Freedom, criticized in a recent interview the approach of the current bills for their mandate, creation of a “public option,” and lack of malpractice liability reform. Considered one of the best neurosurgeons in the world, Carson gained acclaim in the ’80s and ‘90s for his pioneering operations separating conjoined twins joined at the head and other procedures that have saved children from epilepsy and brain cancer. But Carson is also celebrated for his personal story of overcoming poverty and prejudice. An African-American, Carson grew up in a single-parent home Detroit ghetto, but his mother pushed him and his brother to achieve excellence. He is the author of the popular autobiography “Gifted Hands: The Ben Carson Story,” which was made into a TV movie this year with Cuba Gooding Jr. portraying Carson. And he does much philanthropic work through charities such as his “Carson Scholars” fund. Over the past few years, Carson has been writing and speaking more about public policy, including health care reform. He has railed against excessive litigation, pointing out how much malpractice insurance and other forms of “defensive medicine” to protect against lawsuits add to medical costs. In the interview with WLOS, Carson insisted that tort reform must go “hand in hand” as part of any true health care reform. Carson’s colleagues at Hopkins – ranked by U.S. News and World Report for 19 years as the nation’s best overall hospital and lauded for the millions it spends on charity care for the poor –have also voiced concerns about the direction that health care legislation is going. Citing the cuts to hospitals to pay for the goal of universal coverage – cuts of more than $150 billion in Medicare and Medicaid payments to hospitals, according to the Congressional Budget office “preliminary analysis” of the Max Baucus’ Senate Finance Committee bill – the Hopkins officials have been warning about severe stress on Hopkins and other hospitals that Hopkins and other hospitals would face. View and Print pdf file.